The Center for Sustainable Living is resuming the Community Composting Project once again! Over the years we’ve begun to realize that our Community Composting Project is more about creating community (in an interesting way), than it is just the collection of food scraps. We’re happy to tell you that we will be resuming this project once again! Beginning in September and going through the end of October, we will be collecting compost at the Northfield Farmers Market. at the Red Tail Farm stand. More details on winter composting options will be forthcoming in the month of October once details are worked out. 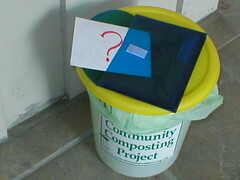 If you know of others wishing to compost, The Center for Sustainable Living can deliver a â€œcompost kitâ€ consisting of a bucket and information to anyone wishing to become a member of CSL. Membership is only $25/year. As well, if you have an address change or are no longer needing your compost bucket and would like to return it, send us an email at compost@centerforsustainableliving.org and we will accommodate your wishes! Be sure to include your name, address, telephone, and email contact information, so that we may deliver your bucket to your doorstep!